One of the reasons for playing around with my N00GA (the AM03127 based LED sign you can get from Maplins) was to see if I could get to use it as a large LED matrix rather than as a scrolling text sign. You can, but it is a bit involved. The technical manual does a pretty good job of telling you how to define the graphic blocks, but it is not a complete description and a bit of experimentation is in order. Whilst there is some code around that appears to include functions to define and show graphic blocks, again there isn’t much by way of explanation of how it works, so here goes. 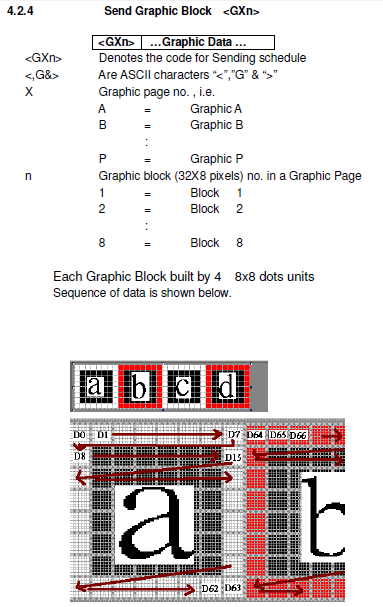 Each graphic block is defined in an 8×8 chunk, and there are 4 of these 8×8 chunks in each graphics block – as per the diagram in the manual. So that there are so that there are 32×8 “pixels” in each graphic block. Each block itself is defined using a <Gpn> command and then incorporated into a message to be displayed so it is trivial to define one block and repeat it many times in the display (once you realise these are two different commands). In my case, there is no Row 8 for the N00GA – it is a 80×7 display, so these two bytes are ignored (but still required). Now this is the bit that no-one seems to mention in anything I’ve found discussing these modules so far. Whilst most of the protocol for driving these devices via RS232 uses ASCII encoded messages, this bit does not! These are encoded sequentially as raw binary values (not encoded into ASCII as dec or hex) so they will go over the serial line using the numerical range 0..255. Yes, if echoed to a terminal, you’d see everything from NULL (0, 0x00) through the control characters right up to DEL (127, 0x7F) and then beyond using the extended 0x80-0xFF range. So to use graphics, you really have to avoid any of the useful line-terminal related options – like echo or cat and just send it out ‘as is’. 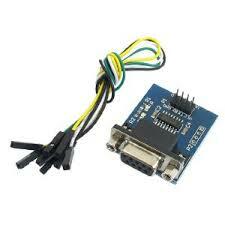 For me, this mean grabbing the Perl Device::SerialPort module. These values are written sequentially following the <GA1>, <GA2> or <GA3> command, which defines graphic blocks 1, 2 or 3 for the first page (A). where “<” “G” “A” “1” and “>” are all the ASCII characters for <GA1> as you’d expect, but each of the 64 “n”s is a single byte “raw” value from 0x00 through to 0xFF. To encode a full 80×7 matrix, it will need GA1, GA2 and some of GA3 (GA1 = columns 1 to 32, GA2 = columns 33 to 64, GA3 = columns 65 to 80, with 81 to 96 unused). 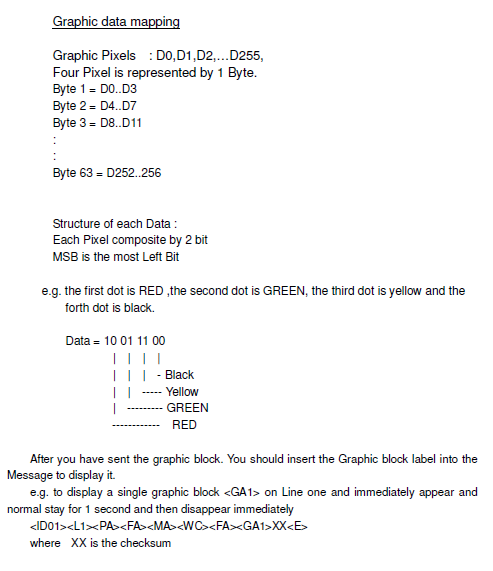 GA – As discussed above to insert the graphic blocks. So all that remains is to write a function to take an 80×7 structure as an input and turn it into the three 64-byte sequences required to define GA1, GA2 and GA3 and then send this command to display them. The following perl subroutine will take a single 8 bit value, representing one of the rows in one of the 8×8 chunks of a graphics block, and return the two raw bytes ready to be inserted into the <GAn> command. I expect there is a much more elegant way to do this, but this will do for now! Then something will need to chop the 80×7 input into these 8 bit rows calling this subroutine as required for each value (and not forgetting to insert a dummy “row 8” value each time). Unfortunately, so far, every time I send a new command across to define a new graphics block, the display appears to flicker … not quite sure if that can be prevented. But it seems that once it has the message to display the three graphics blocks, that message does not need sending again if the graphic block changes. I have a tri-colour LED matrix sign from Maplins (a bit like this one) that has an 80×7 two-colour LED display (red and green, and when both are on, a kind of orange). This has a serial port connection so I wanted to hook this up to my Raspberry Pi. The original sign is supposed to come with a USB to DB9 Serial and then DB9 Serial to RJ11 set of leads to allow you to connect the sign to a PC, but mine doesn’t have these. But most importantly, this contains the technical manual for the N00GA which details the serial protocol. But what I wanted to do was drive this from the on-board GPIO UART from the Raspberry Pi, and I couldn’t find an obvious description of what was required to make this happen. After much reading, searching and a bit of experimentation, eventually I managed to assemble all the bits and work through the joys of the many standard RS232 pin-outs for DB9 connectors and the non-standard RS232 pin-outs for RJ11 connectors and come up with the following. First, to get to any kind of standard RS232 port from the GPIO UART a level shifter is required to go from the 3.3/5v RPi I/O to the +-12v required for RS232 serial ports. Thankfully these are trivial to find based on the MAX3232 chip, so I got one that includes a built-in DB9 port and 4 pin connections for VCC, RXD, TXD, GND. For some reason, these all seem to come with a female DB9 port, so I guess they are designed to link to a PC as if the jumper wires and MAX3232 breakout board make the equivalent of a null modem cable between the Pi and the PC. I had an old RJ11 to RJ11 telephone cable, so I ripped the plug off one end and set about working out which wires go where. The combination that worked for me was linking TXD on the display to TXD on the DB9 socket, RXD to RXD and GND to GND. I think that sort of follows the diagram in the manual, but the cable colours of my telephone lead didn’t match that at all. So once you realise that everything connects to the same labelled pin, you should be fine. Unfortunately it is not possible to test this with a simple terminal program such as minicom, as the time between key presses is too much for the protocol to be followed (I guess if you had it line buffered it might work, but I didn’t look into this), but it is possible to “cat” some commands to the display to see if it is all working ok.
Also, you need to have disabled the RPi console, which by default will be attached to the serial port. There are good instructions for that here. The first sets the ID of the display to 01 (the display ID can be anything from 01 to FF, 00 means broadcast to all connected displays). The second command sets the display to its dimmest setting. The 04 is a checksum value and will depend on the command given. If this doesn’t work, you’ll need to get debugging and checking cables, etc. One tool that is great for driving the sign programmatically is the sample python code mentioned above. I had to install the python-serial library before using it, but then it worked very well. The only slight quirk, is that the sample code doesn’t appear to call the sync_set_sign_id() function, so if you are not sure what ID your sign is (the default should be 01) you might need to set it using the cat method above or hack a call to the function into the code. Having an incorrect ID may generate a “timeout” error when using the script in verbose mode (i.e. with -v as shown above). If you want to experiment with your own commands, then you’ll have to implement something to calculate the checksums. The following simple Perl script will take a command message for the display and output the text you’ll need for the complete command, including the checksum value. I now plan to get to work on the technical manual and decipher some of the more sophisticated commands, especially those that let me get graphics sent to the display. All this was possible thanks to those who have already worked out how to drive this thing. All I needed was the details of how to connect it physically to my RPi GPIO. Which I now have. I like tinkering with my Raspberry Pi, but I also tend to have them configured for remote SSH to save dragging out a keyboard and screen. I also use the small Edimax WiFi USB dongles, but I also just like to let the pi find its own address on the network using DHCP … so I often need to either hook up to my routers admin/status page to see what nodes it has found or just attempt to connect to a few nodes in the range I know will be used for the pi. Eventually I got fed up with doing this, so instead I wrote a very simple perl script to use Net::Ping to scan a small range of addresses and report on which ones are responding, and then see if port 22 (SSH) or 80 (web) are open. Then I know where my pi is. Net::Ping can use the tcp for ping, which has the advantage that you don’t need privileges for the script to use icmp. The disadvantage is that most things won’t respond to the tcp echo port. Consequently, I use Net::Ping in two modes – first with icmp to see if the host is alive, then with tcp to probe the ports I’m interested in. This does require it to be run with administrator privileges, but that is fine for me. I don’t scan a whole range, that would take too long for this very simplistic case, so I just scan 20 or so addresses that I am interested in. There are a wealth of network scanning and management applications out there, but this has the advantage of being very simple. Just what I needed. Below is the code. Nothing exciting – about as simple as it gets, but it works. To run from Windows, I use a simple batch file to call the perl interpreter with the script, then pause afterwards (to give me a chance to read the output). This can then be used by right-click -> run as administrator. Basically this takes a sequence of numbers, scales it to a pitch range you select, gives you options for translating pitch – e.g. scale backwards, replace specific notes with another note, use division or modulo arithmetic, etc – and then gives you options for applying a duration to each note – either a fixed duration or using a scaling formula. Finally you have the option to play it, download it as a MIDI file or see it in a crude representation of notation. There are a number of ‘preset’ options to get you going – I experimented listening to pi, the Fibonacci sequence and their ‘chaos algorithm‘ using ranges of 0 to 88 (a full piano range) and 40 to 52 (basically an octave starting from middle C). I tended to use a fixed duration of 0 or 1 as it went by suitably quickly and kept things interesting. Then I thought I’d try something a little different. Using the option to ‘import your own sequence’ I took a wander over to Google Trends. This plots the frequency of people searching for specific terms over time. If you login with your Google account you can download the results as a CSV and then its trivial to open it in a spreadsheet, select the column of results and paste it into the Music Algorithms form and listen to what something sounds like. Default ‘swine flu‘ search that Google Trends offers. This works well scaled 0 to 88, as the pitch then mirrors the graph quite well. I didn’t paste in all the zeros, just the portion with the shape and got a nice quickly peaking and decaying piece. Considering the date, Halloween was an interesting one – you get a random sounding very quickly rising and falling scale and then silence … the ration of silence to scale is around 1 in 12 funnily enough and the pattern repeats 8 times (for 2004 to the present day) … this works well with a duration of 0 across the full piano range – nice and quick. The text ‘music algorithms‘ generated a curious pattern – reasonably random around a specific value, but that value has slowly decayed over time. Then I tried a whole range of whatever came into my head looking for an interesting graph – seeing fluctuating searches, lots of rising trends – then finally settled on Tim Berners-Lee. Not sure why! But that gives a nice, angry sounding (especially on duration zero) left-hand piano line for the majority of the data set, generally getting slightly lower, adding to the angry nature, until there is a quick high flourish representing him appearing in the Olympics opening ceremony! I only played the MIDI files back using the standard instrument, i.e. a basic piano sound. It would be really interesting to actually use some of these data sets to define a synthesized timbre too. Could be the start of a very interesting musical piece.